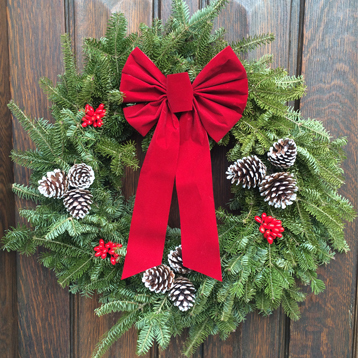 Adorn your loved one’s resting place with an elegant Deluxe Holiday Wreath, custom trimmed with cones, berries and bow, carefully placed at the monument by Newton Cemetery staff. Decorations will be placed at the location noted on the order form and will remain on display until the beginning of January. Please feel free to contact us at 617-332-0047 if you have questions or need assistance. Download and print the form to order by mail.